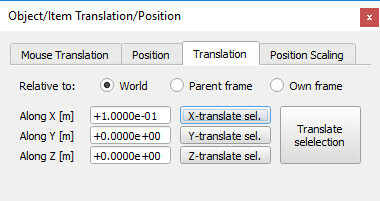 In this section of the dialog, translation parameters of objects manipulated with the mouse can be set. See also the page on object movement via the mouse. Relative to world/parent frame/own frame: indicates that a mouse drag will translate the selected object on a plane or line that is aligned with the absolute reference frame, aligned with the parent object reference frame, or aligned with the object's own reference frame. 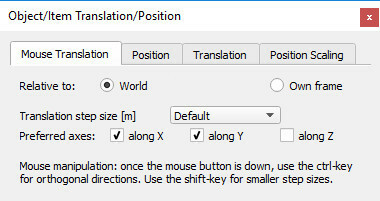 Translation step size: the step size used when translating the selected object with a mouse drag (see the user settings dialog for default step sizes). Smaller step sized can still be used during manipulation by pressing the shift-key after the mouse button was pressed down. Preferred axes: along X/ along Y/ along Z: indicates that a mouse drag allows translating the selected object along preferred axes of the reference frame selected above. Other axes can be used during manipulation by pressing the ctrl-key after the mouse button was pressed down. In this section of the dialog, precise positioning can be achieved on objects or items. Relative to world/parent frame: indicates that the coordinates are relative to the absolute reference frame, or relative to the parent reference frame. X-/ Y- / Z-coordinate: position of the selected object relative to the indicated reference frame (world or parent). In this section of the dialog, precise object or item translation can be achieved. Relative to world/parent frame/own frame: indicates that the translation will be relative to the absolute reference frame, relative to the parent reference frame, or relative to the object's own reference frame. 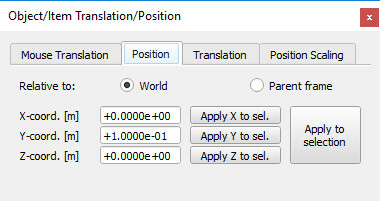 Translate along X / Y / Z: indicates the desired translation amounts along the x-, y- and z-axis of the indicated reference frame (world, parent or own frame). 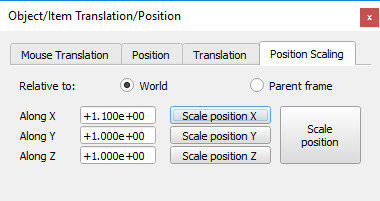 In this section of the dialog, precise scaling of object or item's position can be achieved. Relative to world/parent frame: indicates that the position scaling will be relative to the absolute reference frame, or relative to the parent reference frame. Scale along X / Y / Z: indicates the desired position scaling along the x-, y- and z-axis of the indicated reference frame (world or parent).